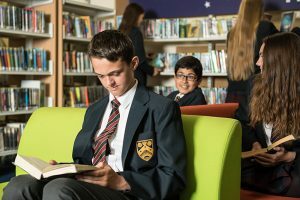 At Ormiston Denes Academy, we are working hard to promote our students’ literacy and ensure they all achieve to the very best of their ability. We believe all teachers are teachers of literacy. The key skills of reading, writing, and oral communication are what enable students to access all areas of the curriculum. Every student leaves the academy with the literacy skills to succeed in the future, measured as a grade 5 or above in English. Those students who join the academy below the national average level are supported in order to help them rapidly improve. The national average corresponds to a standardised reading score of 100. Every student leaves the academy with the communication skills required to be successful in the future and a vocabulary of 50,000 words. The measure of this is that they are competent at written and oral communication. Our whole community supporting high-quality speaking and listening, reading and writing (Whole Academy measures). Literacy being fundamental to every lesson. Students leading their own learning. Students utilising the skills they bring from primary school. We support literacy in every lesson by sharing the key words with students and using the whole-school literacy marking code to provide feedback on spelling, punctuation and grammar. This means, that in every lesson, the students quickly recognise the marking code and errors enabling them to make rapid and sustained progress. We place high value on reading widely and often – students are encouraged to read books across a variety of genres. We have a library we are proud of with a range of interesting books for every learner and all abilities. Throughout the academy day, during lessons and around the school, students are encouraged to use Standard English in conversations, both with their peers and with adults. In form time there is a weekly literacy session which is linked to the literacy challenge of the week to ensure students are able to use punctuation and grammar accurately and effectively. A “Word of the Week” is communicated to all students each week and they have to use this word in each lesson to help increase and develop their vocabularies.